Its leaves or needles grow 10 to 18 inches long, in crowded clusters of 3 to a sheath; cones are 6 to 10 inches long and dull brown. The strongest of the southern yellow pines, it is used in construction, for railroad ties, poles, piling and for pulp. This tree can grow on sites too dry and sterile for the other yellow pines. Pinus palustris, commonly known as the Longleaf Pine, reaches a height of 98–115 ft and a diameter of 28 in. Longleaf Pine takes 100 to 150 years to become full size and may live to 500 years old. When young, they grow a long taproot, which usually is 6.6–9.8 ft long. It is one of the two southeastern U.S. pines with long needles. The bark is thick, reddish-brown, and scaly. The 10 to 18 inch long leaves are often twisted. The cones, both female seed cones and male pollen cones, are initiated during the growing season before buds emerge. Pollen cones begin forming in July, while seed conelets are formed in August. Pollination occurs early the following spring, with the male cones which are 1.2–3.1 in long. The female (seed) cones mature in about twenty months from pollination. When mature they are yellow-brown in color, 5.9–9.8 in long, and 2.0–2.8 in broad, opening to 4.7 in, and have a small, but sharp, downward-pointing spine on the middle of each scale. The seeds are 0.28–0.35 in long, with a 0.98–1.6 in wing. Longleaf Pine is highly resistant to fire. New seedlings do not appear at all tree-like and resemble a green fountain of needles. This form is called the grass stage. During this stage, which lasts for 5–12 years, vertical growth is very slow, and the tree may take a number of years simply to grow ankle-high. 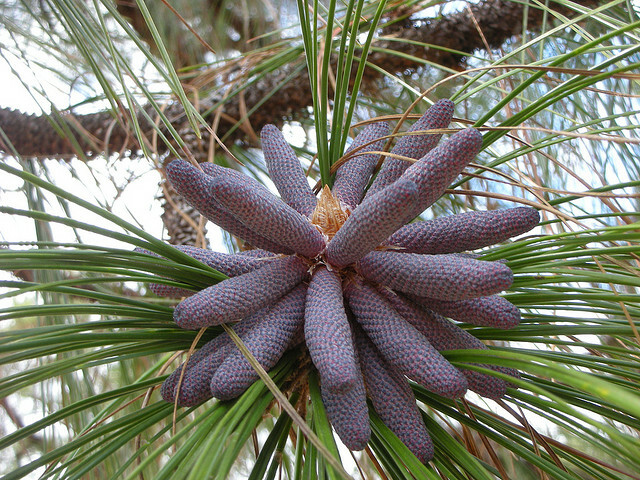 Longleaf Pines seeds are large and nutritious, forming a significant food source for birds and other wildlife. The yellow, resinous wood is used for lumber and pulp. The extremely long needles are popular for use in the ancient craft of coiled basket making. The stumps and taproots of old trees become saturated with resin and will not rot. Farmers sometimes find old buried stumps. These usually are dug up and sold as Fatwood, "fat lighter" or "lighter wood" which is in demand as kindling for fireplaces, wood stoves, and barbecue pits.